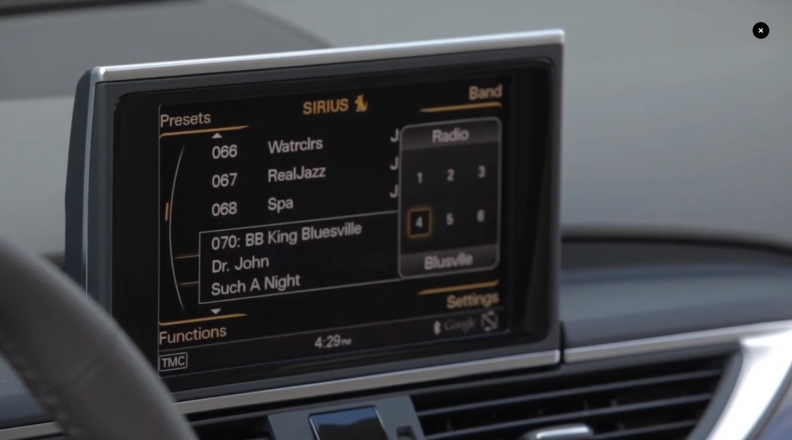 A screen capture of a video showing Audi's MMI interface, which uses BlackBerry's QNX software. DETROIT (Bloomberg) -- Ford Motor Co., struggling with in-car technology flaws, will base the next-generation Sync system on BlackBerry's QNX and no longer use Microsoft's Windows, according to people briefed on the matter. Using QNX will be less expensive than licensing Microsoft technology and will improve the flexibility and speed of the next Sync system, the people, who asked not to be identified because the decision hasn't been made public, said. Ford has more than 7 million vehicles on the road with Sync using Microsoft voice-activated software to make mobile-phone calls and play music. The switch may help Ford address customer complaints about malfunctioning technology systems and touch screens that have hurt it in surveys by J.D. Power & Associates and Consumer Reports. For BlackBerry, it's a vote of support for a company that lost 95 percent of its value from mid-2008 to November and saw the collapse of a proposed $4.7 billion buyout. "This would be a huge infusion of trust and confidence to have BlackBerry and QNX expanding into a Ford," Thilo Koslowski, auto analyst for researcher Gartner in Santa Clara, California, said. "This is really the crown jewel in BlackBerry's crown and could make the rest of the company shine as well." Since becoming BlackBerry's CEO on Nov. 4, John Chen cited software such as QNX and the BlackBerry Messenger service as assets he will look to capitalize on. Predecessor Thorsten Heins spoke often during his tenure for the potential of QNX to play a role in machine-to-machine settings such as cars interacting with parking meters. Improving Sync is crucial for Ford to draw car shoppers who are increasingly looking to be connected at all times. In-vehicle technology is the top selling point for 39 percent of auto buyers, more than twice the 14 percent who say their first consideration is traditional performance measures such as power and speed, according to a study by the consulting firm Accenture released in December. "We do not discuss details of our work with others or speculate on future products for competitive reasons," Susannah Wesley, a Ford spokeswoman, wrote in an e-mail. Peter Wootton, a spokesman for Microsoft, declined to comment. Paul Leroux, a spokesman for QNX, declined to comment. Ford and Lincoln ranked Nos. 26 and 27 out of 28 brands in Consumer Reports' annual auto-reliability survey released in the U.S. in October. While the Lincoln luxury line matched the industry average in J.D. Power's Initial Quality study in June, the namesake finished 27th out of 33 brands. Technology companies are competing to win business from automakers as in-car technology becomes an increasingly important selling point. Google announced an alliance with General Motors Co., Honda, Hyundai and chipmaker Nvidia in January to bring the Android operating system to cars. Apple is working with BMW, Mercedes-Benz, Nissan and others to introduce its iOS operating system to cars with devices such as the iPhone. BlackBerry's QNX Software Systems can be found in cars made made by Audi unit and BMW, according to its Web site. QNX and Microsoft are the main suppliers of automotive operating system software, according to researcher IHS iSuppli. BlackBerry, at the time named Research in Motion, bought QNX Software Systems for $200 million in 2010. In addition to its presence in cars, QNX technology is used to manage nuclear-power plants and by the U.S. military for unmanned aerial drones. Its customers include Cisco Systems Inc., General Electric Co. and Caterpillar. The switch would be a significant blow to Microsoft's automotive software business because Ford is by far its biggest customer, said Gartner's Koslowski. Microsoft also has software in Kia, Fiat, Nissan and BMW models, according to its Web site. Getting into the Ford system will expand QNX's industry leading position for automotive entertainment operating systems, which Koslowski said he estimates is as high as 70 percent. The operating system in the car entertainment system has become more of a commodity and now added functions are more important, he said. QNX has done a better job of integrating compatibility with other operating systems such as those from Apple, Google and included emerging Internet standards, he said. "You have to look at it more from a perspective of how much functionality do I get for what price and really move your investment budgets to other areas that become much more strategic for creating differentiation," Koslowski said. "The industry is realizing it has to do a better job to create a unique experience for its customers."